Welcome to YugAgro: the largest exhibition for agricultural machinery and crop farming equipment in Russia. As the biggest event of its kind in Russia, it’s the first port of call for international companies looking to supply in-demand products to Russian farmers, agribusinesses and farming organisations. There are many reasons why you should be a part of this fantastic B2B event. Let’s look at them below. YugAgro’s audience is composed exclusively of professionals who eat and breathe agriculture – the vast, vast bulk of which hold purchasing authority. As an exhibitor, taking part guarantees getting your products directly in front of thousands of key decision makers. 16,990 visitors were at YugAgro 2017, which was a 7% increase. See this roundup of YugAgro by the numbers for more information on who you can meet at the show. This gives you peerless networking opportunities with the Russian buyers that matter most. What’s more, 35 countries were represented at the latest instalment of the event, giving your business and brand impeccable reach. Krasnodar is YugAgro’s home. For those familiar with Russian farming, Krasnodar will be a very familiar name. It is, by some margin, Russia’s most fruitful and productive agrarian province. Over 14 million tons of produce is grown and harvested across the Krasnodar region every year. It is also one of the biggest recipients of government cash, in the form of farming machinery subsidies, anywhere in Russia. It’s here where demand is highest for modern crop cultivation gear – and YugAgro lets you reach the farmers generating this demand in a place that is convenient to them. Convenience is key for Russian buyers, so make sure you’re in the heartland of Russian agriculture to meet those all-important purchasing figures. Russia’s import market for the type of products on display at YugAgro is huge - $1.2 billion-worth-a -year huge. At present, the nation is engaged in a policy of import substation. Food and drink items from former key suppliers are under embargo, which means it’s up to domestic companies to fill supply gaps. That means further investment in agriculture, and so further investment in new farming apparatus. Everything is on the import manifest, from greenhouse technology through to large-scale forage harvesters and all products in between. A lucrative market is waiting for you in Russia. Access it at YugAgro. As well as the networking opportunities available at the show, there is also the industry-leading programme of Business Events. Talks, seminars, roundtables and more in-depth discussions make up YugAgro’s Business Programme. Guest speakers are major players in the world of agriculture and attract many more visitors to the event. Taking part is a great way to get detail on major trends, topics, and issues straight from the characters most intimately involved in the industry’s development. In the face of its import ban, Russia’s agricultural sector is booming right now. As we briefly touched on earlier, this is largely down to domestic producers shouldering the burden to feed the rest of Russia’s 144 million strong population. Imports of key agrarian products are banned in Russia from EU states, the US, and others. Driven by this strong impetus, farmers are harvesting greater volume of crops than at any time in the post-Soviet era. Roughly 135 million tons of produce was harvested in Russia in 2017, and the harvest is on course for similar performance this year. With this increased performance comes greater profitability for Russian firms. However, the industry still lags behind western equivalents. Why? A lack of modern farming machinery. Now returns are higher, farm representatives and agribusinesses have more cash to spend on these solutions. Find these key buyers at YugAgro. 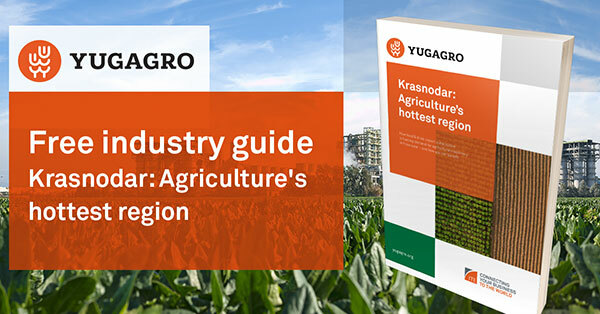 YugAgro is Russia’s largest event for agricultural and crop farming machinery – and holds the keys to your success in one of the world’s largest farming markets. Why not experience all the show has to offer for yourself? Join us as an exhibitor or a visitor to enjoy a huge professional audience, an international presence, and more opportunities to grow your business throughout Russia’s huge agriculture sector.